Role-playing gaming must rate as the cheapest entertainment around. Even if a game master buys an adventure to run, five other people get hours of fun from the purchase. And those hours come from a slim packet of pages. A hardcover adventure will sustain a campaign for a year. A few bucks spent on dice and maybe on a core book can sustain a player for years. Compare that to the price of comic books or collectable card games or, heaven forbid, golf. The low cost of role playing makes selling RPGs a tough business. Players can only spend so much time at the game table, and a few purchases will fill all those hours. Back in the 80s and into the 90s, role-playing games seemed like a better business. 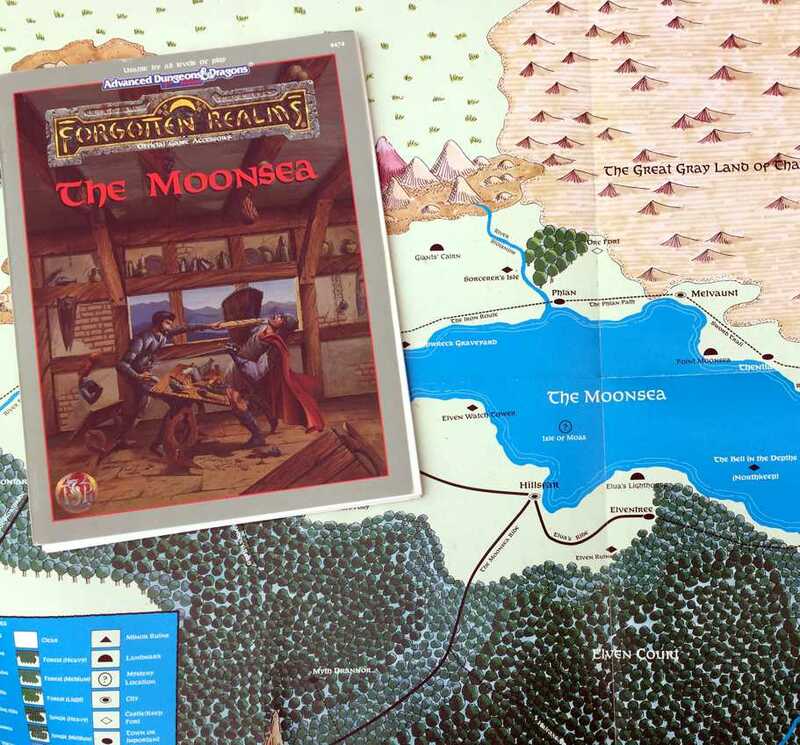 Every major RPG line produced a new book or box every month, and TSR produced several. Sure TSR suffered setbacks, but their problem came from wild spending on things like company cars and needlepoint companies. The RPG products sold. Most of the folks buying those books and box sets probably used a tiny fraction in play. Who had the time? Even if real life never interfered with your gaming, you didn’t have four friends who shared your passion and freedom. During all the hours you wanted to play games like Dungeons & Dragons but couldn’t, you settled for exploring the game world by reading its source books. So the Complete Guide to the Tribes of the Southeast Highlands of S’norr sold to be read rather than played. Electronic games took away the appeal of lonely fun. Now wherever you have a laptop or phone, you can game. “People are just playing games now,” Mearls says. By the 90s, too few gamers bought game books to fill time between games. Nonetheless, TSR kept publishing until the cost of unsold books brought the company near bankruptcy. TSR sold itself to Wizards of the Coast. The sale spared D&D from becoming a mere brand, a once-proud name like Atari, now used by a winning bidder to sell video games. When Wizards’ executive Ryan Dancey took charge of reviving D&D, he wondered how to build a business on a cheap pastime. Only D&D’s core books made much money. Dancey saw profit in selling the Player’s Handbook and character options to players, but D&D needed adventures and settings to attract dungeon masters. Dancey plotted a strategy around opening the game: Companies could support D&D with low-margin settings and adventures based on the d20 license, while Wizards reaped the real money selling the core. Under this new plan, Wizards launched D&D’s third edition. For a year, core books and player-option books dominated the game’s releases. But the new game succeeded beyond expectations. Its sales boom lured the company back to printing settings and setting books. Once again, DMs faced more books than they could use. When the boom ended, the D&D team began suffering annual layoffs. By D&D’s fourth edition, everyone knew too few players bought campaign-setting books to make much money, and that few DMs bought more books than they could use in play. So fourth edition limited each campaign setting to two books: one for DMs and one with player options. The 4E team refocused on selling books for players. The D&D team hoped every player would spend hours tinkering with character options, making a hobby of not playing the game that they wanted to play. Every month, hardcovers filled with new options reached stores. But the strategy fizzled. Too few players wanted to devote time to lonely fun sitting around making characters. Now, streaming and video offers a new way to watch people play D&D—and a new way to enjoy D&D while not playing D&D and not buying D&D books. World of Warcraft and Acquisitions Incorporated may not replace all the joy of rolling dice with live people. However, for most folks, such substitutes make a better alternative to the D&D table than either pouring over Martial Power 2 for character options or reading The Great Glacier to explore a game world. The D&D brand extends beyond the game table to things like novels and electronic games. Today, tabletop gamers add to D&D’s profit margin by buying core books. Wizards publishes other D&D game books to support sales of the core. Mike Mearls and his D&D team see little market for game materials that won’t reach play. This shows in their focus on the adventures required by DMs and destined for the game table. The team produces just enough adventures to sustain weekly sessions. More adventures would tempt DMs to buy just the one they’ll play. Such choices stretch the profit of one sale over the cost of publishing more adventures. In the years since the fifth edition’s release, only the Sword Coast Adventurer’s Guide caters to folks who want to read about D&D worlds or spend time tinkering with character builds. For those of us who crave more monsters and classes, fifth edition’s few releases leave us hungry for more, but the Wizards team thinks they have a D&D strategy that can last. This entry was posted in Uncategorized and tagged Mike Mearls, Ryan Dancey, TSR, Wizards of the Coast. Bookmark the permalink. Wish I could take credit for the phrase “lonely fun” but I’m just repeating a phrase I’ve heard around the hobby. I think I first heard it from Jason Morningstar, but I’m not sure he’s the originator. Thanks for setting me straight. “Lonely fun” is such an evocative phrase that I hoped to credit whoever coined it. The idea of “Lonely fun” goes all the way back to the first edition of Traveller . In the book they talk about building characters and worlds if separated by distance or circumstance. The other thing that contributes to this is that for many DM’s (most?) believe that they can do better than the published works. The ability to create homebrewed content that works just the way you want it to results in less demand for published scenarios. Perhaps this only really counts for those who have been in the hobby a long time. I generally always play the DM, and I have such a backlog in ideas and areas to explore that I haven’t seen a need in picking up any of the published 5E adventures. I did get the Sword Coast guide, but I’ve not put it to great use as yet. Overall, I would agree on the focus to keep D&D as a distinct product, and not just a label to license out to third-parties. For me it was a matter of necessity. In the 2E days, I could go down to the bookstore and pick from a dozen published adventures. They weren’t always very good, but it saved you a lot of time and work. Not only that, but the systems were very backwards compatible, so I could run old first edition or even Basic D&D adventures. So I always had a backlog of stuff to run. When 3E came out they broke compatibility, so old adventures required more work to adapt. The stream of published adventures slowed to a crawl while players were buying splatbooks like mad and clamoring for new adventures for their shiny new classes. I had to start running more homebrew content because they just didn’t make enough modules. I like the “Adventure Path” idea or making serial adventures into seasons, but it’s not quite as good as the large array of choices you once had. Thank you for this informative and succinctly written analysis. I think this overlooks the function of the DM’s Guild, both as a source of content and as a moneymaking machine. You’re right that they figured out that the margins for splatbboks were lower; they’ve just responded by outsourcing that kind of content generation, while still skimming a healthy bit off the top. The cycle of splatbooks creates the need for new editions, as we see going all the way back to 1e. They’ve decided to get off that train for this edition, because the time they spend constructing and playtesting a new edition is a huge risk and totally tanks their sales of current product. They want to push off 5.5 or 6e as long as possible, and as a fan, I want the same thing. I think you’re right about the DMGuild. It appears to be striking that balance of new content vs. investment of time on WotC’s part. I also want to keep 6E out in the future as long as possible. Interesting article; I like that term “lonely fun”. It was part of D&D almost from the beginning; the first issue of the Strategic Review had an article by Gygax on “Solo Dungeons” (later incorporated into the 1E DMG as Random Dungeon Generation). And I’m sure solo gamebooks (CYA, Endless Quest, Tolkien Quest) experienced their boom in the ’80s due to this. In addition to videogames, “lonely fun” is replaced these days by social media participation including blogging, posting and chatting about RPGs. I dig this article. At the same time, I think your take that “The RPG products sold” for 2E is questionable. Some TSR staff say that, but it often seems to be from a sort of personal defensive stance regarding the products for which they were personally responsible. Other staff talk about how TSR was selling many products (including entire categories of products) that lost money. Boxed Sets are a common example, but there are others. Dragon Dice, novels, needlepoint, Gary in limousines around LA, and all sorts of other things confuse the picture, but I think it is questionable whether the plethora of setting material truly sold well in the day. In the three US states I frequented during those time periods, the shelves were full of D&D sourcebooks that never sold. I would see the pile grow over time, with the same books sitting in the bins and not moving. The same was true of other games that used that strategy (Shadowrun, etc.). I do think there is a difference in how gamers approach spare time, and it likely has an impact, but I still think there is something there inherent in the production cycle and product type. The simplest explanation I know is that sourcebooks suffer greatly from decreasing returns due to being of interest to an increasingly small market. To spell it out: the core books have wide appeal. That’s the game, 100%. If you like it, you wait with bated breath for the next thing. Okay, it’s world x. But, it’s the first product and almost everyone is excited and buys it. But, at some point the next product is a book about something with a more narrow focus, such as undead, or the planes, or a particular region. Any of those necessarily has a smaller audience. We enter seriously diminishing returns. You also reach a price and utility point, where people feel they have what they need or what they are willing to spend. All of it causes a drop-off, but not necessarily due to time. In the 2E era, for money reasons I said “no” to Planescape. Seemed great, but I just couldn’t afford everything. And, within worlds I liked, I said “no” to products that didn’t meet my needs (books on undead, for example). For me, that the amount of product was more than I could buy was easily visible. 3E was similar, but for players. Complete X became so ridiculous we all made fun of it in organized play. “Stay tuned for complete Animal Companion!” And, it is interesting to note that the OGL vision (which I believe was larger than just Dancey’s) was predicated on really sticking to core books and then shrinking the D&D team. That vision really was never in place. The Hero Builder’s Guidebook is from the same year as 3E, is full of “will only appeal to some players” content, and even lists Dancey as one of the three authors. (The product code is, hilariously, TSR11647, despite being a WotC product). Sword and Fist (2001) was one of many 3E player splatbooks, all part of the original 3E strategy that seems similar to the rest of 3 and 3.5’s product history. 4E designers at an early convention talked about how they were changing their strategy to not be world-specific, due to limited appeal. A book wouldn’t be the FR guide to undead, it would be undead for all worlds. And they limited setting content sharply. But they didn’t do it for player content. They flooded it, most notably with Adventurer’s Vault, which in a single product overwhelmed almost every player with an insane flood of stuff. Chris Perkins later had a survey for DMs about which products they owned. It was amazing that the quality of the product seemed to matter very little. As time passed, the number of DMs owning something always dropped. This was even for really great and I would say critical products, such as the excellent Monster Vault that added important monster updates. It is vastly superior to the original 4E MM, but a fraction of DMs owned it. Will 5E be different? Diminishing returns and appeal are economic truths. We HAVE to see declining sales. No way that 100% of people buying the Tyranny of Dragons adventures also want to run/read Strahd and Storm King. It just isn’t how humans work. But, the strategy is vastly different. If they keep appealing to new players, then that doesn’t matter. If the strategy of seasons creates many ways to enjoy the content, then a lot of people could remain hooked. The part of me that sat through economics classes wants to coldly say, “but for how long?” A counter to it may be that the strategy is creating new classic moments… I hope to blog about that soon! Thanks for putting so much thought into this reply. Great stuff! New books must either revisit familiar territory or delve into smaller and smaller niches. Either way, they appeal to fewer customers. Potential new players face an intimidating shelf full of product. Mountains of options contribute to power creep, complicate the game, and frustrate fans. With “Lonely Fun”, I aimed to explain an additional, largely-unnoticed pressure that I suspect the D&D team has considered. Paizo benefits from a leaner company and a level of business sense that TSR never shared. They enjoy passionate fans and a subscription model that raises margins and provides steady cash. Their store provides an additional revenue stream. Pathfinder now faces the classic problems of a mature RPG. Nonetheless, every year at Gen Con, players queue for the latest Pathfinder book, and then fill the Sagamore ballroom. I’m eager to see what Paizo does to keep their success going. Support the tabletop game with a minimal staff to keep costs sustainable. Release just enough adventures to support the DMs running weekly games. Release only enough settings and character options to keep fans hungry for more. Turn the other expenses of supporting the game into a revenue stream through the DMs Guild. By releasing adventures tied to story seasons, Wizards almost treats D&D books like magazines on a rack. New players can pick up the latest issue without feeling the need to catch up from the beginning. This benefit obviously applies to adventures, but it also applies to settings and character options linked to the adventures. Rather than an intimidating a shelf of books, potential customers just face one tied to the latest story. I wonder how much future character options will link to story seasons? I suspect the D&D team has put a lot of discussion and research into figuring the right amount of product. They hope to find a strategy that will allow 5E to endure far longer than past editions. I can’t resist writing more about TSR’s history. Nobody seems to disagree that TSR’s troubles before 1985 came from rampant overspending based on the notion that D&D would grow indefinitely. During the Loraine Williams era, most witnesses say TSR (a) overestimated the market, (b) split customers between product lines, (c) sold products for less than they cost to publish, and (d) flooded distributors with returnable product that eventually was returned. TSR executives from the era tend to blame TSR’s crash on all the D&D players who switched to Magic the Gathering and other TCGs. I’m sure that didn’t help. Your comments regarding Pathfinder and the problem it faces as a mature RPG got me to thinking. Regarding PF vs. D&D (and not trying to restart the edition wars! ), perhaps there are two distinct player types that are being catered to. On the one hand, it seems to me that PF is centered more around the idea that a PC with 40 AC and +32 to hit is the goal, and Paizo supports that by giving lots of options to get there. Of course, this is an outside observation since I don’t play PF, but it seems to tailor toward the Min/Max crowd. For other DM’s and players, it’s too much to keep up with. Too many bonuses, and sources to keep track of. This other group needs a ruleset that can be picked up easily and doesn’t require constant attention to stay up to date. That seems to be where 5E decided to go. Less releases, but it retains a different sort of player. As the DM of our group, I don’t feel so burned out after playing 5E. It certainly is less prep time than 3.5 became at the end. I didn’t check out either PF or 5E at GenCon this year, but with Baldman moving out to a separate venue, I’m guessing that they did okay again. Pity that WotC has given up attending as a company though. As an addendum to Teos’ spot-on analysis, not only do subsequent splatbooks see diminishing returns, but they also actively set up a barrier for new players joining the full. And Teos did not overestimate the need for new players to grow and sustain the hobby. So while a vocal 20% of the consumers might be clamoring for new player material at $30/book, that has to be weighed against the new players that will not spend $150 on the core books because there are so many $30 books on the market that only 20% of the player base are buying. This psychological barrier to entry for new players when too many splatbooks are in use cannot be ignored. Thanks again, David. I really appreciate your insight into the hobby. I love knowing what goes on “behind the scenes” and in the business arena with RPGs and with hobby gaming in general. I really enjoy all the information you’re able to share. Keep it up! The problem with the seasonal adventure modules (more like the novel serializations of old) is that they do in some measure reduce sales. In the old days I’d buy modules all the time for ideas, but we hardly ever played with them, party because we valued sandbox, in great measure because we wanted to exercise our own imaginations, and partly because *we figured everyone else had read them too*. I don’t buy and read the new adventures because one of the guys at our table runs them. Until we’re beyond them I don’t want to read them and risk winding up where I was when everyone wanted to go back and visit the old Hill Giants module. So in a way WotC has lost perhaps 3 sales because there is so little fodder we leave it to the DM so we don’t spoil our fun. There’s also Critical Role from Geek & Sundry (http://geekandsundry.com/shows/critical-role/) to fill in watching people play and DM a D&D game. It started off as Pathfinder and is now 5e. I would like to see more game aids. As part of Hasbro now, they should be able to offer dungeon tiles, 3-D terrain, and miniature scenery at more-affordable prices than most of currently-available options. As an adult with disposable income but little time, this is a pretty low limit to the amount of adventure and crunch content I will buy, but I’ll happily spend money on making my table more interesting for my monthly games. I don’t have time to create my own terrain and pain expensive lead (or even Bones) minis. If they could get the cost down, Hasbro may be able to also market them as toys for kids. This is my first comment on your blog, and just wanted to say that the quality of your posts are tremendously high and thought provoking. Thanks for your efforts Dave! Although player splat books have never been my thing, I certainly have fallen into the “lonely fun” category with setting material and adventures, always going through the creative exercise on how I might weave the material or ideas into a long term campaign. To that end, I loved the pace of all those TSR and 3e WotC releases, even though the quality was sometimes dubious. Thanks for the kind words. The folks at wizards sees everyone playing the same mods as a positive. By playing the same adventures, the D&D community enjoys a shared experience that everyone can talk about. We haven’t seen a similar unity since the early days of the game when only a few modules came out every year. More than quality, that shared experience vaulted the early modules to their status as classics. I don’t think lonely fun has gone away as such, but there are so many outlets in the era of the net and electronic gaming that PnP publishers no longer have the monopoly they once had. People do make and remake characters for the sake of making characters — in electronic games. People do parse through the lore of D&D — in other media, like wikis. There’s been a resurgence of interest in older edition lore even among people who’d never play a game with a THAC0, and a fair bit of demand for conversion between editions. I’m not sure how Wizards can properly collect the info they need to try and turn this data into money but I do also feel like they haven’t quite hit the market nail on the head as yet. Great series of articles. I feel the need to add that (in my opinion) the published adventures have improved dramatically since Tyranny of Dragons. To be fair to Kobold Press (which I love), I believe that Tyranny was written with only a beta version of the rules, which may have hindered things somewhat. I think the WoTC internally designed/published adventures have been superior to those that were created by third party publishers (though I feel that Out of the Abyss was something of a misstep). Just my 2 cp.